Kristian Ayoungman died in the early morning hours of March 17. Siksika Nation council is considering acquiring legal services as they move forward in support of Melodie Ayoungman. Ayoungman lost her son Kristian Ayoungman in the early morning hours of March 17 on a rural highway near Strathmore. Kristian, accompanied by three other Siksika members, was shot in the vehicle they were travelling in. RCMP have charged Brandon Daniel Giffen and Kody Allan Giffen, both of Strathmore, with first degree murder. “This afternoon (April 8) we’re going to be discussing (legal services) at the council level,” said Councillor Reuben Breaker, who is also serving as spokesperson for the family. He has attended Strathmore Provincial Court for all three appearances of the two accused men. The discussion is being prompted by a letter from Melodie Ayoungman. “(She’s asking for) support in terms of making sure that justice, I guess that the procedure and the process, is carried out properly and nothing’s missed out,” said Breaker. She further wrote, "I want to ensure that the future for my remaining children, the victims, and all of Siksika feel safe as we move forward from this tragic event and that we can continue to have good relations with the town of Strathmore." Brandon Giffen, 25, made his first appearance at Strathmore Provincial Court April 5. Kody Giffen, 22, has made two court appearances. Neither has entered pleas. Both men remain in police custody. Their next court appearances are set for April 16. 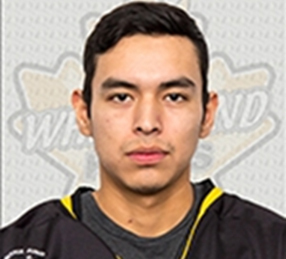 On March 16, Ayoungman, 24, and Brooker Pretty Young Man, also from Siksika Nation, played in the Strathmore Wheatland Kings Junior B hockey alumni game. The team, which they had been members of, was celebrating 10 years. The pair was accompanied by two friends. It was in the early morning hours after the game that Ayoungman was killed. A week after the incident, Siksika council met with Strathmore mayor and council, where they “deliberated and debriefed,” said Breaker. A second meeting will be held shortly to outline next steps. Breaker said Siksika Nation members contribute strongly to the Strathmore economy, and depending where on the reserve members live, many attend school and play sports in Strathmore. “We’ve had a relationship for the most part, in my experience, it’s been good. But you hear stories of others. I’m not going to say there hasn’t been any (bad experiences) in the past. There has,” said Breaker, who attended school in Strathmore and played sports there. Breaker would not speculate on whether the circumstances of Ayoungman’s death were racially motivated. “At this time, it’s still very early in the process. In the courts, the disclosure hasn’t even been presented yet. Until that happens, we can’t speak on other matters,” he said. The disclosure is the copy of evidence the police and Crown has collected to prosecute the case. The Wheatland Kings held a celebration of life for Ayoungman on April 5 in the Strathmore arena as part of their year-end awards.